Advantages: Knowledgeable contributors, excellent format, scale plans, full colour photographs, variety of topics. Conclusion: An excellent resource for WWI model enthusiasts. It contains a diverse range of subject matter in its 34 pages and the recognized authorities are only too pleased to pass that knowledge on to the reader. 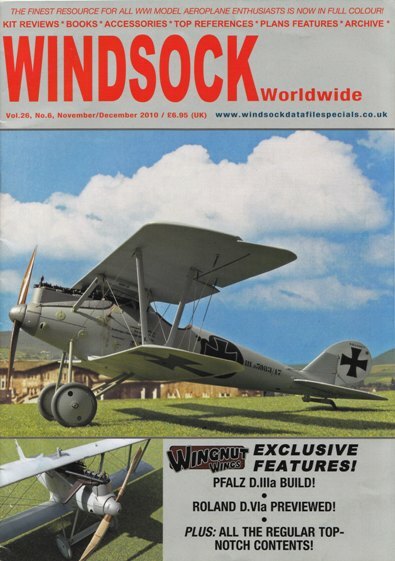 Last year’s final issue of Windsock Worldwide has arrived and it is an eagerly awaited one for fans of the Wingnut Wings range of kits. Dominating the magazine is Ray Rimell’s exclusive build of the WNW Pfalz D.IIIa. Spread over 9 pages, it takes is an in-depth look at how best to put this kit together and offers plenty of hints and tips along the way. Over 40 step-by-step are included with lots of accompanying narrative. The 1:32 scale theme continues with reviews of the aforementioned manufacturer’s Roland D.VIa and the Roden Sopwith Triplane, the latter also including a side view drawing to help elaborate on the text. The popular “Modelling Master Class” series continues with part 2 of Lance Krieg’s look at improving airframes. With 7 pages of instructional images and an informative explanation of the techniques involved, the writer offers a multitude of ways on how to improve this highly visible area. The discussion centres on adding stringers, ribs, fabricating new wings, re-skinning, vacforming new parts, and a lot more besides. “Rara Avis” will appeal to those looking for something different. This time the Lloyd LK.I (40.08) Austro-Hungarian Triplane bomber comes under the spotlight. With its 2 x 160hp & 1 x 300hp Daimler engines, it certainly looked an ungainly machine and it is not surprising that only one was ever built. Complementing the article are 1:72 scale drawings that come from the Ian Stair archives. The customary “Readers’ Gallery” displays the aircraft of avid Windsock readers and the usual comprehensive roundup of reviews completes the publication with a look at the latest kits, books, decals, tools and periodicals. If you have the slightest interest in aircraft from the first “great conflict”, then this is the magazine for you.